Senior forward Jared Wilson-Frame (4), pictured here against Duke, made eight of 16 3-pointers for a game-high 24 points in his final college game against Syracuse Wednesday night. Pitt men’s basketball entered Tuesday night’s primetime matchup at Clemson as one of the nation’s top teams at defending the 3-pointer, ranked No. 16 and holding opponents to 29.1 percent from distance. Clemson, conversely, entered as one of the NCAA’s worst 3-point shooting teams, ranked No. 315 out of 353 teams at 30.6 percent. Apparently, a lot. In a scenario straight out of the “Twilight Zone,” the Panthers found themselves at the mercy of an otherworldly shooting performance from Clemson. The Tigers drained six of their first seven 3-pointers to put the game away early, leading to an 82-69 final score — which made the game appear far closer than it actually was — and extending Pitt’s season-long losing streak to four games. Clemson was supposed to be a fairly beatable opponent, a chance for Pitt to catch a break — especially compared to the ranked foes the Panthers faced in six of their previous seven games. The two teams came in with similar records, with Pitt at 12-8 overall, 2-5 in the ACC and Clemson at 11-8 overall, 1-5 in the ACC. Pitt’s defense struggled without first-year forward Au’Diese Toney, typically viewed as one of the team’s more dynamic defenders, who was absent from the game due to a hand injury. Whatever the case, Pitt had no answer for the Tigers, who drained threes of every sort — contested, wide open, off the dribble, assisted — en route to a first-half lead that for a moment stood at 29. Clemson took a double-digit lead in the blink of an eye, getting up 15-5 just five minutes into the game. It was a total team effort, with each starter contributing exactly one basket. The Tigers’ run continued until it stood at 14-0 and their lead at 22-5. To summarize the game’s first eight minutes, Clemson knocked down its first four 3-point attempts while Pitt committed four turnovers. Senior forward Jared Wilson-Frame finally knocked down a three of his own to end the Clemson run and make it 22-8, but the bucket failed to shift any momentum toward Pitt. Graduate guards Marcquise Reed and Shelton Mitchell each made another three to put Clemson up a conclusive 32-12 at the 9:00 mark. At that point, Clemson was shooting an almost unfathomable 6-8 from beyond the arc, 11-15 from the field and 4-5 from the free throw line. Mitchell was one of the Tigers’ key contributors, shooting a perfect 5-5 in the first half including 4-4 from three. His fourth 3-pointer made it 35-14, then a pull-up three from sophomore guard Clyde Trapp made it 38-16 with 6:40 remaining. Pitt’s low-water mark came with a minute left in the half, when another Trapp three and a pair of free throws from sophomore forward Aamir Simms made it 49-20. A Wilson-Frame 3-pointer made it 51-23 heading into the break — Pitt’s worst halftime deficit of the season. The flukish first half saw Clemson shoot a scorching 67 percent from the field and 60 percent from 3-point range, compared to Pitt’s respective 38 and 30 percent. First-year guard Xavier Johnson was the Panthers’ lone bright spot, notching 11 points while no other teammate scored more than six. For Clemson, both Reed and Mitchell had 14 points. The second half featured even play between the two teams, with Pitt and Clemson both shooting a more-realistic 5-12 from 3-point range. But it didn’t matter, as the game was essentially decided after a lopsided opening half. Head coach Jeff Capel used the blowout as an opportunity to get minutes for rarely used players like sophomore forward Samson George, who finished with a season-high 10 minutes and three points. To the Panthers’ credit, they finished the game on a 13-0 run to make the deficit a deceiving — but more respectable-looking — 13 points. Johnson played the remainder of junk time like a man possessed, scoring 19 in the second half and finishing with a season-high 30 points on an impressive 10-14 from the field, 3-3 from three and 7-8 from the free throw line. But Pitt’s other first-year superstar, guard Trey McGowens, turned in one of his worst performances of the year, scoring just five points on 2-9 shooting. The South Carolina native, who grew up and went to high school mere miles from Clemson’s campus, received a warm welcome from the crowd — which included many hometown friends and family — during pre-game introductions, but was held under 10 points for the third time in four games. For Clemson, the trio of Reed, Mitchell and Trapp all finished with four made 3-pointers. Reed showed why he’s the fourth-leading scorer in the ACC by leading Clemson with 26 points. 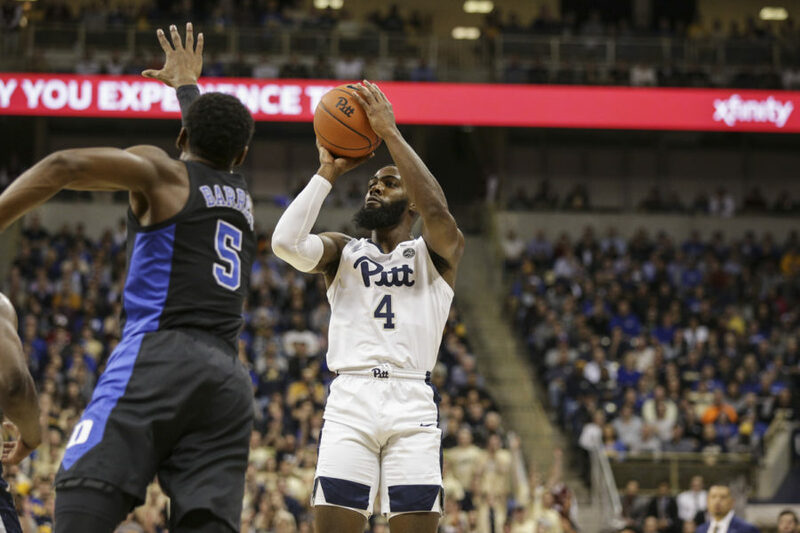 The loss continues Pitt’s worrisome four-game skid, a streak which has seen the team’s record drop from 12-5 overall and 2-2 in the ACC to 12-9 and 2-6. Pitt heads back home for its next game this Saturday against Syracuse. The Panthers will look to get back in the win column and avenge a 63-74 loss suffered at the hands of the Orange from earlier this season. Tip-off is set for 6 p.m.